Marina Picasso introduced Chapeau Bleu in 1994. This feminine scent possesses a blend of oakmoss and woods. Accompanied by fruity notes of fresh citrus. 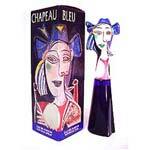 Chapeau Bleu is recommended for casual use.